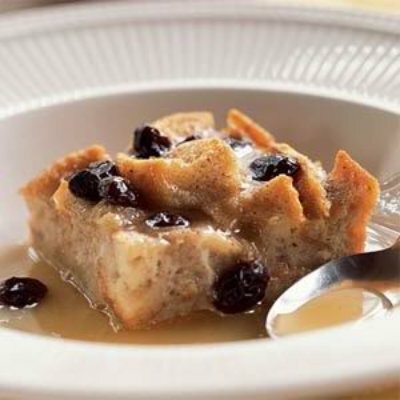 Gluten Free Bread pudding is super easy and cleans up all of those bread ends and baking disasters for me. You can throw anything into a bread pudding. Stale gluten free cake, doughnuts, quick bread, muffins or sandwich bread. I love mine with dried blueberries that I soak in a little rum to rehydrate. 6-8 slices Gluten Free thick whole grain day-old bread, cubed ( You can use stale cake, quick bread or muffins too) or appx 4 cups. Lay your cubed bread and fruit or nuts out evenly in a large 2-qt. baking dish sprayed with cooking oil. Whisk the eggs in another bowl. Add milk, sugar of choice, vanilla and pour over bread. Press the bread gently down. Let soak while the oven heats. Optional water bath- This method helps the pudding so it doesn't dry out but it can be dangerous. Carefully place your baking dish onto a larger high side baking sheet or broiler pan in the oven. Fill the bottom pan with warm water about 1/2 way up the smaller baking dish. Bake, uncovered, in preheated oven for appx 45 minutes or until a knife inserted near the center comes out mostly clean and the pudding springs back when you touch it. If you used the water bath carefully lift the pudding from the water bath pan. Leave the water bath pan in the oven to cool before removing. For sauce, combine the sugar and cornstarch in a saucepan. Stir in water until smooth; bring to a boil over medium heat. Boil for 1-2 minutes, stirring constantly. Remove from the heat; stir in lemon juice, peel and butter until butter melts. Serve over warm or cold pudding. Refrigerate any leftovers.